Leave it to the Japanese. Just this week, stores in Japan started selling bakeable Kit Kat bars in chocolate and and pudding flavors. The Kit Kats puff up and transform into a Pop Tart-ish pastry when placed in the toaster oven. The Japanese, being the crazy geniuses that they are, have started selling pizzas topped with the new bakeable custard Kit Kats for a limited time only. The baked Kit Kat pizzas will be part of the menu at the Napoli no Kama and Strawberry Cones pizza chains, reports Rocket News 24. Last Friday, Napoli no Kama began offering a Kit Kat and Mango Dolce Pizza, which sells for 1,630 yen ($16) for a medium size pizza. It comes topped with the pudding-flavored bakeable Kit Kats, mango slices, mixed nuts, Gorgonzola cheese sauce, and honey maple sauce. That’s one insane-sounding pie. 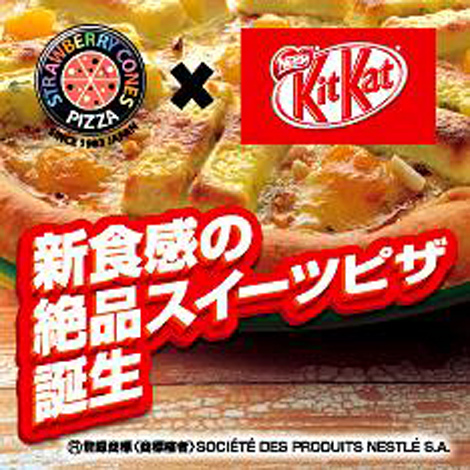 The other Kit Kat pizza on offer, which comes from a pizza chain called Strawberry Cones, involves basically the same exact ingredients. Swagger jacking much? Chains are thinking beyond pizza when it comes to the potential of the new bakeable Kit Kat bars. Wired Cafe’s Baked Kit Kat Cara-melted Sundae will be available from mid-May at a price of 650 yen ($6.25) at five of their Tokyo locations. 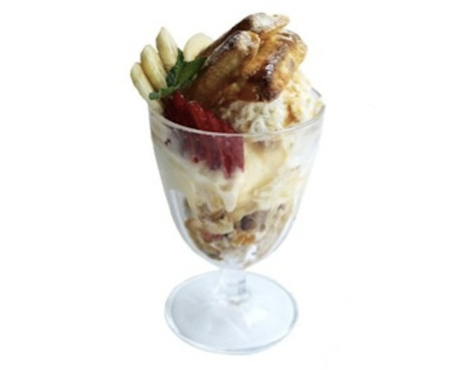 The sundae combines the Kit Kats with fruit, granola, and vanilla ice cream. We’re very much into this emerging use-Kit Kats-in-everything trend.